Deep Magic of the Dwarf-Rings! Since the dawn of the world, dwarven smiths have fashioned rings of surpassing beauty—but it is not for the sake of beauty alone that these rings are made. There is power in them, which can be unlocked by the wise. Ring magic practitioners channel their magic through these rune-etched metal bands, increasing the devastation wreaked upon their foes; and can even imbue them with spells that someone else can unleash later. 12 new spells, including enchant ring, curse ring, and create ring servant (with monster stats for this new construct), and more! Journey deep within the earth, to places where molten rock flows like rivers, and the sounds of hammers never cease. Here you will find the true power of the rings—learn their ways, and use them wisely and well. Most of us know “One Ring to rule them all, One Ring to find them, One Ring to bring them all and in the darkness bind them” even if we cannot recite the entire verse… but have you ever stopped to contemplate magic rings within your game? In this work, it’s suggested that magic ring manufacture is a dwarf thing. Now dwarves as a whole don’t tend to be into magic much, their creative outlet is in making and shaping physical items but in forging rings and embuing them with power they reach a fusion of physical and magic creativity like none other. Geometrically, the ring is an unusual shape for a dwarf: they tend to prefer angles and straight lines over curves, never mind a smooth circle with no beginning or end. Yet they make fine ones, often inscribed with runes and encrusted with jewels, perfect for the storing and wielding of magical power. Opening with quite a bit of fascinating background linking dwarves with this specific magic item, we then move on to a couple of feats related to ring magic as a whole before meeting the new arcane tradition of the Ring Warden. Rare outside of dwarven strongholds, they are recognisable by their staves bound with multiple rings. The Ring Warden’s magic is based on transmutation, blending dwarven craftsmanship with the magic that they use to empower the rings that they make. There’s a sidebar linking Ring Wardens to the Midgard campaign setting, but if you’re not using that, it’s quite straightforward to find suitable locations and background for them in your own campaign world. There are a selection of spells mostly aimed at enchanting rings and other ring-related effects (some of the links being fairly tenuous, like Reverberate where the only connection is that the material component is a metal ring with which you strike the ground to cause it to shake and your opponents to lose their balance! ), and a slew of magic items most of which are, of course, rings. 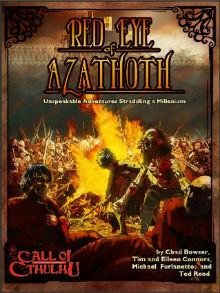 There is a rather wonderful molten fire forge, which anyone who wants to make magic armour, weapons or indeed rings would really want to get their hands on, a full-blown artefact – a sentient ring left by one of the founding Ring Wardens – and a new monster, the ring servant. This is a construct of metal plates around a core of glowing energy. This installment of the Deep magic-series clocks in at 13 pages, 1 page front cover, 1 page editorial, 1 page SRD, 1 page advertisement, leaving us with 9 pages of content, so let’s take a look! So, what the hell is ring magic? Where other magic traditions covered in the series remained pretty self-explanatory, ring magic should be defined and that’s how the pdf starts: Basically, it is a dwarven tradition (Ring der Nibelungen, anyone?) of forging rune-inscribed rings to channel magic energies. 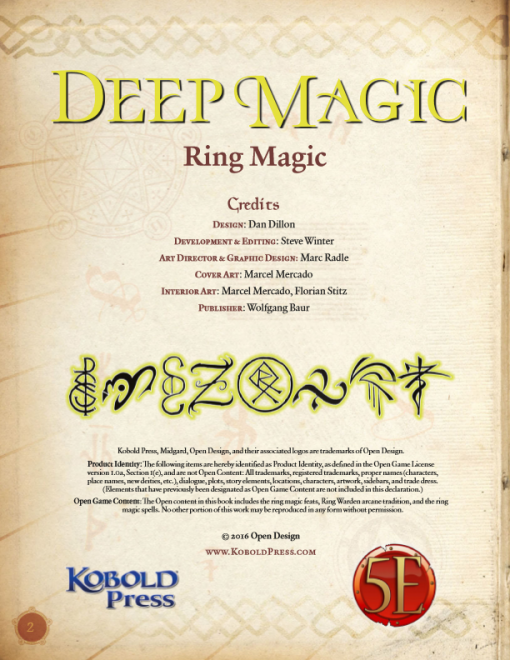 A big plus: The pdf does explain the symbolism of the ring and how the magic tradition came to be – while only brief, this section adds some serious context for the tradition, rooting it more deeply within the context of the game world. There are two feats resented herein that are of interest to users of ring magic: Circle Spellcaster increases one mental attribute by 1, to a maximum of 20 and allows you to spend 2 hours (explicitly possible during a long rest) to generate a mystical bond with another nearby spellcaster. When one of these bonded casters needs to roll concentration, the other may use a reaction and may also make a Constitution saving throw – if one succeeds, the concentration remains unbroken, but if you fail, both spellcasters lose concentration and take 2d6 psychic damage. You may only be bonded to one spellcaster thus and a bond lasts until the end of the next long rest, with new bonds or refreshments superseding existing ones. This feat represents a really cool tweak of the spellcasting engine, with a nice risk/reward ratio – two thumbs up. The second feat herein would be Ring-Bound, which nets advantage on saves versus transmutation spells and allows you to physically bind a ring token to a weapon, a process which takes 1 hour and may be undertaken in conjunction with a short rest. While thus attached, you can spend your bonus action to make the weapon magical until the start of your next turn – in a minor hiccup, I assume this refers to meaning magical for the purpose of overcoming resistances and immunities, not refer to actual magic including bonuses. The ability can be used twice before requiring a short or long rest to recharge. 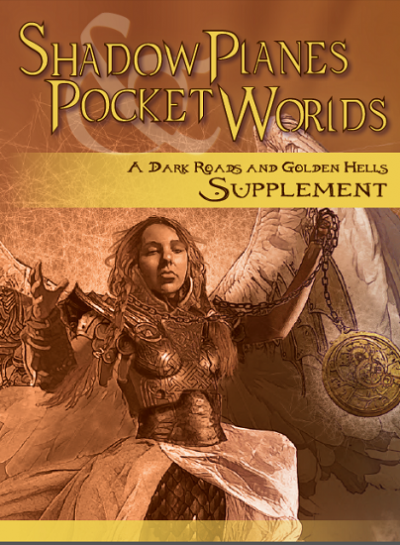 Now, the pdf also features class options, the first of which would be the ring warden, a new arcane tradition, which halves gold and time of transmutations copied into the spellbook at 2nd level and yields bonus proficiency with either blacksmith’s or jeweler’s tools. Moreover, 2nd level provides the bonded ring staff, a special quarterstaff, which may be used as an arcane focus. The staff’s creation comes with precise rules and you may include a number of rings in the staff equal to your wizard level. While holding the wizard staff and rolling spell damage, you may add your proficiency bonus to the damage, and when it deals damage multiple times, you need to choose to which it applies. This may be used a number of times equal to the rings attached to the staff (which are capped by the wizard’s level AND Intelligence modifier, minimum 1) before requiring a short or long rest to recharge. 6th level yields the master metalsmith feature, which lets you add double your proficiency bonus on the tools chosen at 2nd level. You also make double the progress per day when creating magic items with these tools and learn to make a specific magical ring, with a list included and GM-control thankfully maintained. Starting at 10th level, you get imbue ring, which lets you store a spell in a ring – while it is thus stored, you can’t regain it’s spell slot, though. As an action, you can take a spell from an imbued ring and use it yourself or give it to another creature, who may then release it as an action, using your parameters, but otherwise acting as the caster. Imbued rings are ongoing effects for the purpose of dispel magic and proficiency bonus caps the maximum number of spells you can have imbued at any given time. At 14th level, you can embed a ring within the staff, which then grants you its benefits, but does not count towards your maximum number of attuned items. Damn cool! A brief primer on ring magic in the Midgard setting complements the first part of this supplement. Now, obviously, this is Deep Magic, and as such, we also get spells – 12, to be more precise. Hoarfrost is a potent cantrip that lets you make a weapon count as magical and inflict scaling cold damage – however, as a balancing mechanism, you can only maintain one such weapon, balancing the odds of this potent option, Among the 1st-level spells, we have ringstrike, which lets rings orbit you – and when you hit a target with an attack, you may launch one of the rings to strike said target as well, adding bludgeoning damage insult to injury. This would btw. be as well a place as any to note that “At Higher Levels” is only bolded, not bolded and italicized here – only a cosmetic hiccup that will not influence my verdict, but if I don’t mention that, someone is bound to complain. The second 1st-level spell would be circle of wind, which is pretty cool: It nets an AC-boost versus ranged attack and also provides advantage on saves versus extreme environmental heat, gases, etc. –you get the idea. At 2nd level, we have bitter chains, which multiplies a ring into a spiked chain, binding the target on a successful melee spell attack with a potent debuff that also causes damage when moving more than 5 feet. The chains can be slipped or broken and come with AC and hit points. While *personally*, I would have liked to see a damage threshold here (I like the idea that some characters just can’t break certain things), but for balance’s sake, I understand why the threshold-less version was used. The second spell of 2nd level would be reverberate, which has really iconic visuals: You jam your staff down and create a cone of thunder damage that may knock targets prone, with a save to negate being knocked down and to halve the damage incurred. Yes, it is “only” a damage-spell, but it is one that is balanced against comparable options and its visuals are amazing. At 3rd levels, we have innocuous aspect, which affects you and all allies within 20 ft. you choose to affect, concealing you as innocuous objects. Yes, means to see through that deception are provided. Infiltration gold…that made me laugh. Why? I’m a huge fan of the Metal Gear franchise and immediately thought about a group of cardboard boxes infiltrating a fortress of some evil dude. Yeah, I’m weird. 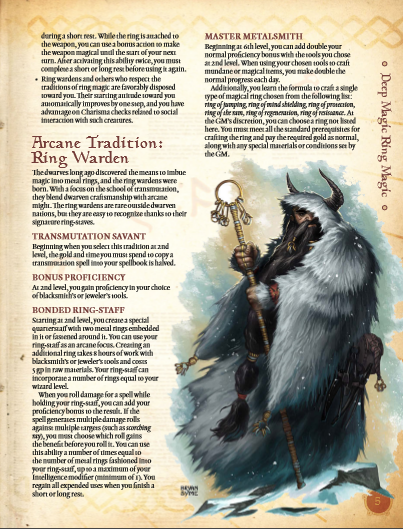 From here on out, each spell level gets one new spell, so in ascending sequence, we get the following spells: Spinning axe is a low-range battle spell that penalizes foes stupid enough to try to get the caster in melee, conjuring a deadly, spectral axe that inflicts force damage and causes bleeding necrotic damage in non-construct/undead, corporeal targets struck. Curse ring lets you do the Alberich and store curses in rings. At 6th level, enchant ring makes the ring very compelling, charming those that take the ring. 7th level’s ringward represents a nice defense buff and at 9th level, circle of devastation can be pictured as a really flexible, moving zone of pain that you can move around – nice! …no, I did not forget the 8th level spell. Create Ring Servant ties in with the new creature included herein, which has btw. also been lavishly illustrated – a challenge 8 adversary (math is correct, btw.) that comes with flight and the ability to generate a devastating low-range aura. Ouch! But we’re not even close to done: As befitting of the theme, we also get new magic items: The molten fire forge item class comes with means to codify the rather opaque crafting mechanics of the system and for that alone deserves serious applause. Oathbound rings are legendary items that not only net you resistance to all 3 physical damage types, they also net you advantage on rolls versus targets that come between you and your oath…but also prevent you from willingly violating your oath. Warden’s Links are basically another item-class –basically, they represent an enchantment for a type of item that may be moved from one item to another, rendering non-magical armors magical, for example. 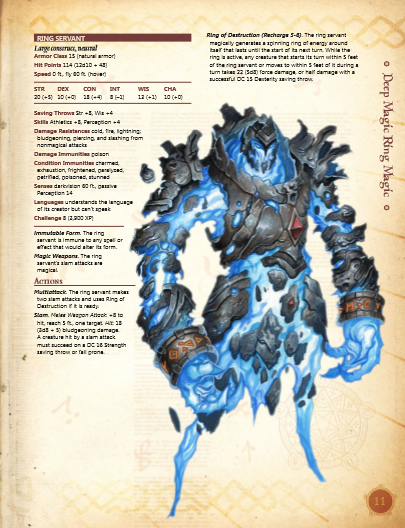 Beyond these, the pdf also includes a ring magic artifact, Karrek’s Bastion , basically a super warden’s link that can be attached to weapons to make them devastating tools of destruction. Editing and formatting are very good on a formal and rules-language level – I noticed no serious hiccups worth mentioning. 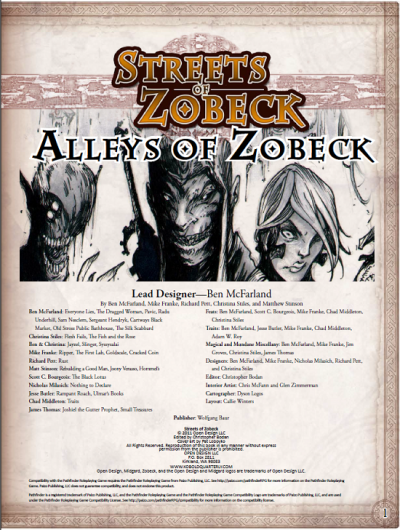 Layout adheres to Kobold Press’ two-column full-color standard and sports absolutely gorgeous full-color artworks. The pdf comes fully bookmarked for your convenience. Dan Dillon of the four horsemen is a 5e-BEAST. I seriously so far haven’t read a single of his pdfs that I did not love in some way. 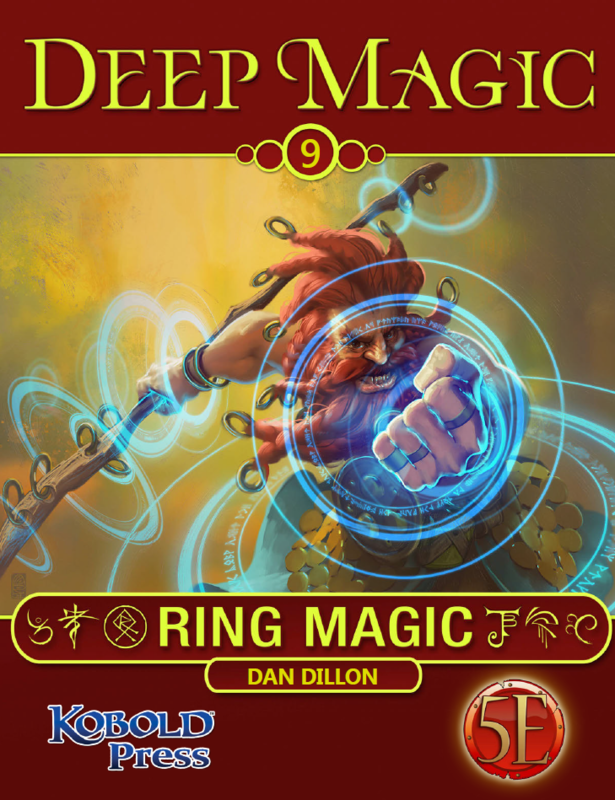 Ring magic may, however, be actually his best work for the series: The magic presented herein not only is really flavorful, it also offers a seriously different playing experience and tackles some rather complex concepts. Balancing, as always in his work, is pretty much impeccable as well. In short: This should be considered to be a must-have offering for 5e-groups, well worth 5 stars + seal of approval.